Do you think the world of publishing is evolving? 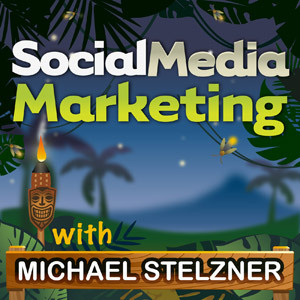 To learn more about how blogs, books and social content have evolved, I interview Guy Kawasaki for this episode of the Social Media Marketing podcast. 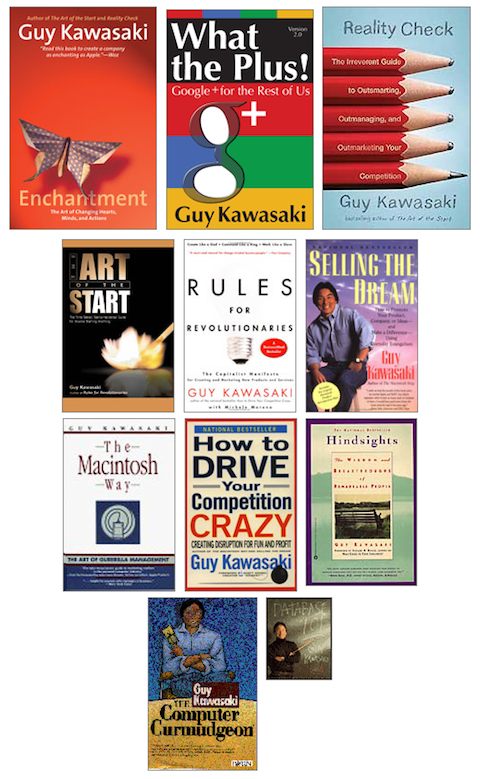 In this episode, I interview Guy Kawasaki, former chief evangelist for Apple and author of many books including Enchantment and What the Plus! Google+ for the Rest of Us. Guy talks about what the book publishing process was like back in 1987 when he published The Macintosh Way and how it has changed since then. He explains the difference between a traditional publishing and self-publishing. Guy has written a number of books since 1987 and he shares his experiences on how publishing has changed. With a traditional publisher, there’s a lot of going back and forth and not a lot of control for the author. The timeline from finishing a book to it being on a shelf is around 6-9 months. Self-publishing today is a completely different world. You’ll discover how Guy’s last book What the Plus was on sale on Kindle six days after he finished writing it. Guy also shares the story of going from an electronic book to a print book. Listen to the show to hear the story of how What the Plus made it to paperback. Guy explains why publishing is an industry in transition, where he feels this industry will go and the opportunities for publishers today. Guy shares how times have changed with desktop publishing and how anybody with InDesign or an Apple Mac and a laser printer can become a publisher. In addition, people with blogs and websites are publishers. With the variety of tablet computers available today, anyone with Microsoft Word can become a publisher. Listen to the show to find out why now is a great time to self-publish. Guy shares his story of how he ran out of ideas to publish on his own blog, which led him to guest writing for the American Express Open Forum, and how he ran out of ideas for that too. You’ll learn why Guy considers his biggest challenges in blogging are to have enough topics to write about over time and to have the time to write. Now with Twitter, Google+ and Facebook, he finds himself more of a curator than a blogger. It’s one thing to generate content; it’s another to curate and find content. Guy says he has evolved from a blogger to a curator, and when he does write, he writes books. Social networks allow him to express himself spontaneously and the deeper ideas go into book format. He explains why a blog is the logical place to start and why he considers blogging good practice before writing a book. You’ll discover the benefits of writing a blog-type post on Google+, compared to a stand-alone blog. Listen to the show to find out why Guy would use Google+ or a Facebook Fan Page today as a platform. Guy explains why his personal approach to Twitter now is unusual. You’ll find out how Guy uses Twitter to curate great content from his website Alltop and a section there called Holy Kaw! Guy uses his personal Twitter account to drive traffic to Holy Kaw! Listen to the show to hear how Guy uses Twitter to drive people to Holy Kaw! Guy explains why marketers should take note of Google+. Google owns the river called search and Google has integrated search with Google+. Google Local is also impacted by Google+. 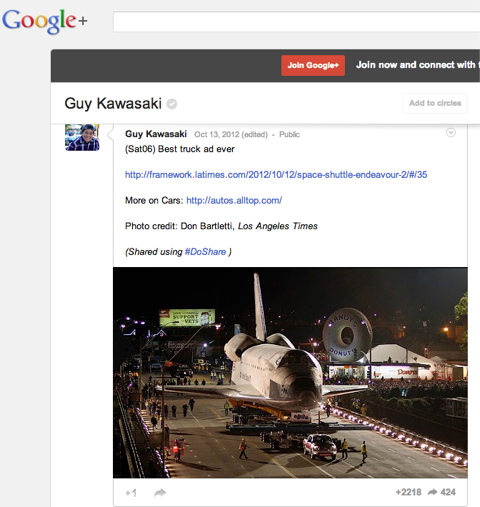 Google has integrated Google+ into most of what it does. Most people make a decision about Google+ based on whether everyone they know on Facebook is also on Google+. But this is not helpful because Google+ has about one-tenth of the users that Facebook has. If you approach Google+ as a Facebook replacement, you’ll be disappointed. Google+ allows Guy to curate content and he talks about how it’s a great resource for an author. Guy says for him, Google+ is a weapon, a platform, a means to an end. 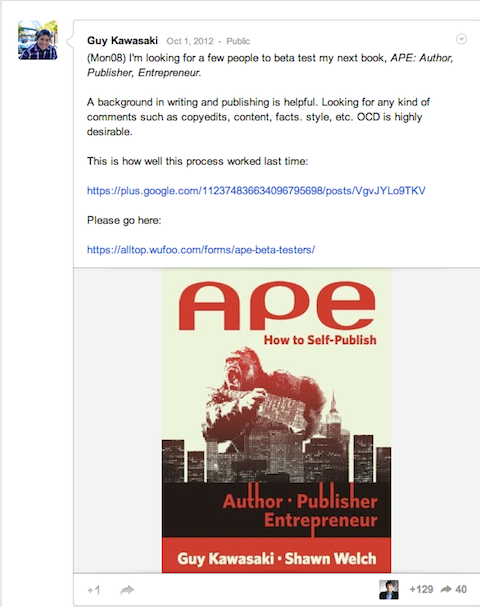 In the final stages of writing his new book APE: Author, Publisher, Entrepreneur, Guy posted this picture of its cover and a request for beta sites. Within 24 hours, he had about 150 people volunteer to test the book. Listen to the show to hear how Google+ can work as a weapon for you. Guy outlines how he uses Google+ on a daily basis. You’ll learn his step-by-step process, from finding an interesting story on Alltop, to sharing the story in his personal Google+ Circle, to scheduling the finished post. He also explains the importance of having a picture that illustrates the story with every Google+ post. It's important to have an image with every Google+ post. Listen to the show to find out why Guy uses Do Share to schedule his posts. LinkedIn makes it easy to give a virtual thumbs-up to all of your first-degree connections in their areas of skills and expertise that they have listed on their LinkedIn Profile. LinkedIn has a window at the top of the public profiles of your first-degree connections which asks you if you want to endorse those particular skills for that connection. By scrolling down further, you can also find a complete list of the skills and areas of expertise your connection has made public on his or her Profile. This is a great networking tool that gives you an easy way to get back on the radar of some of your connections you may have lost contact with. Take a look at Alltop and Holy Kaw! What do you think? What are your thoughts on how publishing is changing? Do you use Google+? Please leave your comments below.